29" x 23" (with frame), inscribed, titled, and dated (1885) verso. Edward Selmar Siebert was born in Washington, D.C. in July, 1856, one of six children. His father, Selmar, ran an engraving and printing shop in Washington at the time. With the outbreak of the Civil War in 1861, his parents returned to their native Germany. In 1872, at age 16, Edward began his art training in Weimar under Albert Baur and Karl Gussow. Siebert returned to Washington, D.C. in 1875, his family having moved there again earlier, but in 1879 he again went to Germany, studying th is time in Munich and Karlsruhe. The artist moved back and forth between Germany and the U.S. several times over the next two decades studying and teaching. 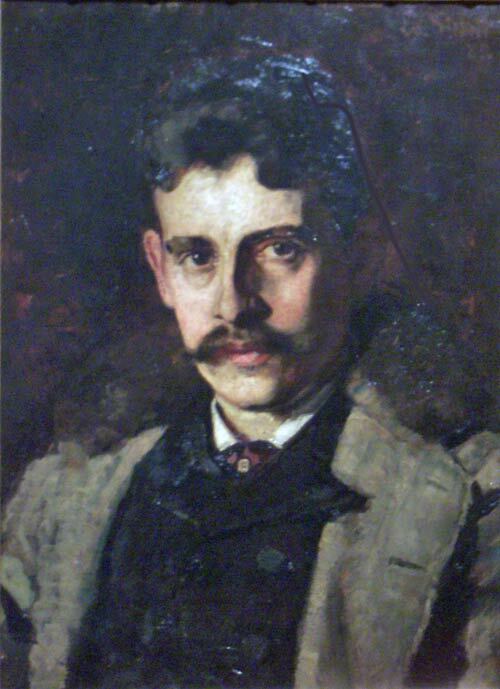 Having become well known for his portraits, Siebert journeyed to Rochester, N.Y. in August, 1911 to paint George N. Saegmuller, a Bausch and Lomb executive. What began as a temporary engagement in Rochester, became a permanent home for the artist. In addition to the Corcoran Gallery, works by Siebert can be found in the Smithsonian American Art Museum, the Memorial Art Gallery of the University of Rochester (NY), and George Washington University.